Food in Korea is a national obsession. I used to think when I first came to Korea that all people talked about was money, until I learned some of the language that is. Then I realised that a lot of the time when people were talking about money they were discssing how much a particular dish or food cost. Food and eating has even gone to the point where ‘did you have lunch?’ is a greeting. Korea is one of the few places in the world where there will be a television in the restaurant where there will be a television programme on about food from a different restaurant. Last year I sat in a restaurant in Gangeung with Herself’s family. I was sitting across from my mother-in-law and Herself’s aunt, and throughout the meal both women went through the menu on the wall discussing how each ingredient in each dish could be made to taste more delicious and how you could prepare it to taste better. Last January when I was here one of the biggest concerns before we left for our isolated location in the mountains was what would be done about food, with not an eyelid batted with the mention that we would have no communication with the outside world for seven days. It is an obsession here. Be that a good or bad thing. 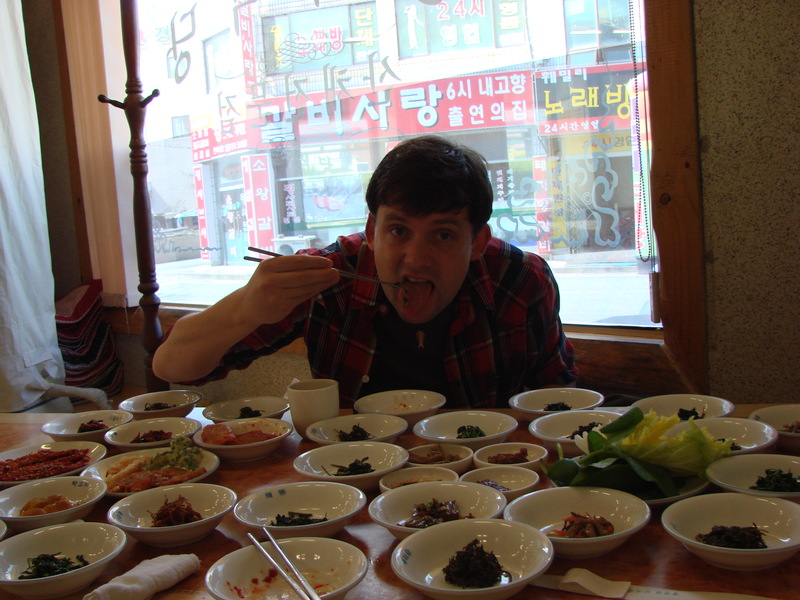 The food is one of my favourite aspects about Korea. And, I know that I am not alone here. Bap (밮) means rice in Korean, or I should say cooked rice. Without rice Koreans would not eat. Rice forms the centre of every meal – not because every meal is called ‘rice’ – because a meal isn’t a meal without rice. Bap is food. But there’s more to it than that. A few days ago Yonhap news came out with the revelation that foreigners had decided that samgyeopsal was the favourite meal of foreigners. This is understandable, and I’ll explain why in a minute. For me, the list of dishes that came in as runners up was a disappointing list of the who’s who of tourist friendly food. Now don’t get me wrong, bibimbap and samgyetang are fine, but they are poor representations of the diversity and deliciousness of Korean food, and are the typical easy dishes you see outside so-called foreigner friendly Korean restaurants in Seoul. These small dishes are what makes Korean food special, and what makes every Korean I have ever known crave bap. Samgyeopsal really doesn’t fall into the category of bap. Sure you can eat your fill and you are served rice, soup, and umpteen side dishes, but the reason samgyeopsal is so great is that it is a unique social eating experience that doesn’t exist in the west where people usually sit at a table and eat from their own dishes from food cooked in a kitchen out of sight. As delicisious the food in a good western style restaurant may be, it’s not anywhere near as exciting. But tell me, how many people go out for samgyeopsal on their own? Where do you stand on eating samgyeopsal on a daily basis? Now bap itself is something totally different. Bap is the meal that a day can’t begin without. You’ve probably heard of Korean people who can’t go without their bap every day, or at least fairly regularly. There may be some who have labelled this as Korean culinary narrow-mindedness, and an opinion that would sit well with the school of thought that complains about the fact that Korean people eat the same food all the time, a fallacy which I don’t really think deserves discussion here. The thing about bap is that it is a delicious meal. One of the best things about it is the wide variety of side-dishes, and not just kimchi, but food like seaweed, radishes, anchovies, spinach, cabbage, and even fish, which appear before you. While sometimes their appearance can be a little off-putting, the fact that they are on separate dishes means you can just avoid them and focus on the food you do like. Even then it’s an adventure experimenting by tasting and mixing different dishes with your bap. And if you run out you can just get more. There’s always a soup, or jiggae, which is hot and packed full of vegetables, an extra treat on those cold winter days. Of course most of this perspective is given from that of eating in a restaurant. Allow me elaborate more on the wonders of bap and why it is a national institution. To be honest, it wasn’t until I started to be served bap at home that I really appreciated this most Korean of institutions. I had taken it for granted and always gone straight for the kimchi – the acid test for the quality of a meal I believed – when my meal was placed before me. Now I go straight for the rice. The thing about Korean rice is that it is heavier than rice I had tried before in Ireland, and is often mixed with several different kinds of grain – I wish I knew the names of the different ones. Korean rice is also kind of sticky so that when you pick a lump up with your chopsticks most of it stays together when you eat it. More importantly, when it cooks the smell is like bread baking, and I mean like delicious, heavy, wholegrain bread. The smell wafts around the home and sits there hanging in the air as the rice cooker hisses away. You might wonder why it’s hard to find good bread outside of the big cities, well here’s the answer, it’s not needed. The locals have bap, and loads of it! The other aspect of bap is important is that it is what can be only described as a hearty meal, and there’s a lot to be said for that. When I was working in the mornings all day I used to start with toast and cereal. By the time I got to work I would have to stop in Paris Baguette, or one of those kips, to fill up again before I went to work. 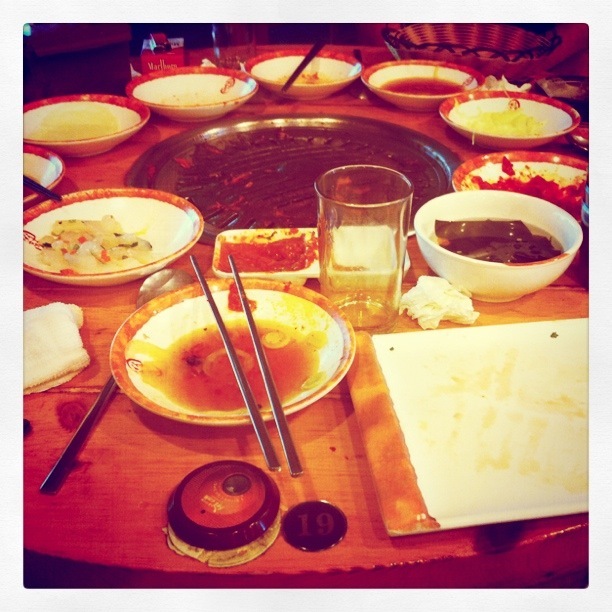 After a good dose of bap in the morning with fried fish, kimchi et all, it was hard to be even hungry by lunchtime. In fact, after not having bap for breakfast it’s hard to return to the western style meals. The only comparison to bap is a dirty big fry-up of sausages, rashers, black and white pudding, mushrooms, toast, and a mug of tea. But if I ate that every morning I’d be in hospital with a vacuum cleaner stuck down my arteries. Yes, bap is magnificent and it’s hard to not appreciate this culinary delight. Of course, it’s not the kind of food you will find in any of the locations popular with foreigners or tourists, but perhaps that’s what’s wrong with the marketing of Korea from a tourist perspective. Far too often I read descriptions of Korea for being a unique culture and then comparing it with somewhere else, or something else, so that people can relate to it. But this isn’t what Korea is all about. Korea is completely different to anywhere else I’ve ever been, and this is what makes it special and makes so many people want to stay. Sure, plenty of these differences make living here infuriating, but it’s also a reason it is such an exciting place to get lost in. Of course the madness of Korea is not what the Korean tourist authorities want Korea visualised as, but there’s a huge market for people who want to go somewhere unique and different. These people will eat with the locals, stay in the dirty-sheeted love motels, get lost in a town whose name they will never learn to pronounce, eat lots and lots of bap, and they will have a great time. Then they will go home to their friends and tell them if they want a truly unique (and somewhat mad) Asian experience, then Korea is the place to go. Believe me, it’s one of the reasons I’m still here and I know I can’t be alone…can I? This entry was tagged bap, best food in korea, delicious, dining, eating, experience, food, foreingers like samgyeopsal, kimchi, korea, korean, meal, obsessed, restaurants, rice, society, tourism, yonhap. Bookmark the permalink.